Goiter can be defined as an enlargement of your thyroid gland that is abnormal. Thyroid is a gland that is butterfly in shape which is located at the neck base, just below your Adam’s apple. Goiters are normally painless. However, a goiter that is very large can make it hard for you to swallow food or breathe, and can cause a cough. Lack of iodine in the diet is the most common cause of goiter in the world. In countries where iodized salt is very common, goiter is caused by under production or overproduction of thyroid nodules or hormones that develop in the gland. Treatment of goiter depends on how big the gland is, the cause of goiter, and the symptoms that an individual is having. Small sized goiters are hard to notice. They hardly ever cause problems, and they do not require any treatment. Swollen thyroid gland, enlarged thyroid, thyroid swellings are other names that can be used to describe goiter. This can cause hoarseness, tightness and coughing. A swollen neck can also give one trouble swallowing. The overactive thyroid can result in a list of other symptoms like palpitations, nervousness, hyperactivity, heat hypersensitivity, increased sweating, fatigue, weight loss and increased appetite if the cause is hyperthyroidism. On the other hand, if the cause is hypothyroidism, the underactive thyroid can result in symptoms like constipation, cold intolerance, personality change, forgetfulness and weight gain. If you suspect that you have goiter, see your GP – they will carry out certain tests to conclude whether or not you have the goiter infection. 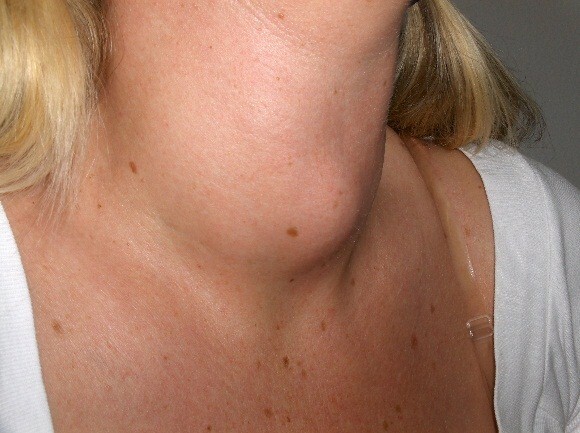 Your neck will be examined by your GP to determine whether or not your thyroid gland is swollen. You may also be referred to a thyroid function test to examine how well your thyroid is functioning. This test measures some hormonal levels in a person’s blood. It helps to show whether your thyroid is underactive or overactive (both cases are linked to goiter). There are different types of goiter, and they all have different causes. Thyroid inflammation can be caused by various conditions. For example, viral infection. The thyroid requires iodine to make T3 and thyroxin. If a diet lacks iodine, the thyroid will swell as it attempts to make sufficient T3 and thyroxin. Autoimmune disorders cause swelling of the thyroid and over manufacture of thyroxin. In autoimmune diseases, the body produces an antibody that causes damage to a part of the body - for example your thyroid. There are people who inherit the tendencies for their thyroids to swell. This is any disorder that may hinder proper production of T3 and thyroxin. In some people, the goiter is associated with an abnormality of thyroid function. You may make too much thyroxin or T3 (overactive thyroid or hyperthyroidism) or too little thyroxin or T3 (underactive thyroid or hypothyroidism). Both will cause goiter. The human chorionic gonadotropin (HCG) may cause your thyroid gland to enlarge slightly. HCG is a hormone produced during pregnancy. Medicines like lithium have side-effects like swelling of the thyroid. This means that there are many nodules or lumps that have developed in the thyroid gland. Generally, the thyroid will feel very lumpy. Some of the causes of single nodule include: cancerous tumor, solid benign tumor (adenoma), and benign tumor filled with fluid (cyst). What Are the Treatments for Goiter? Treatment of goiter depends on the cause of goiter. Oral Iodine supplementation. This will reduce the goiter size, but in most cases, goiter is not resolved completely. Treatment will depend on the cause of hyperthyroidism. For some hyperthyroidism causes, treatment may cause disappearance of goiter. For example, Graves’ disease can be treated by radioactive iodine and it may cause disappearance or decrease of goiter. In Hashimoto’s Thyroiditis and hypothyroid, a thyroid hormone daily pill supplement is given. It restores the levels of the thyroid hormone back to normal. However, the goiter may not completely disappear but it prevents it from getting larger. These goiters are associated with normal thyroid hormone levels in the blood. They do not need specific treatment after correct diagnosis has been made. If there is no diagnosis, the patient may be warned of future risk of becoming hyperthyroid or hypothyroid. If the goiter size brings problems like constricting the airway, surgical removal may be necessary. No matter the cause, you should have regular (yearly) monitoring when you have been diagnosed with goiter. What Are the Home Remedies for Goiter? Eating vegetables rich in iodine: Vegetables like cucumber, garlic, carrots and turnips are beneficial in the treatment of goiter. For those living near the coast, eating locally grown vegetables and fruits will provide them with sufficient iodine. Seafood, seaweed (like sushi) and shellfish (like shrimp) are rich in iodine. Eat them about twice a week. Cow milk and yogurt also contain iodine. On average, a person needs about 150 micrograms of iodine each day. While lactating and pregnant women, need about 200 micrograms of iodine. Reduce excessive intake of iodine: even though it is uncommon, taking excess iodine sometimes causes goiter. If the problem is excess iodine, avoid taking salt that is iodine-fortified, iodine supplements, seaweed and shellfish. Taking tea: Drink tea almonds combined with a teaspoon full of fresh cabbage leaves juice. Drink this mixture twice or thrice a day. Barley water: consume barley water and combine it with a healthy diet to treat goiter. Kachnar: This is orchid tree known for its medicinal purposes. Take the bark of this tree and make a decoction with it. Drink it two times a day.